Initial reports suggest that the 6.5 litre V12 may receive a power boost of approximately 15 kilowatts (20 horsepower), bringing the new ouput close to 490 kW (650 horsepower). In spite of this, and the car’s carbon fibre components, the Reventón accelerates to 100 km/h (62 mph) in the same time as the Murciélago LP640 (3.4 seconds). The instrument panel in the Reventón comprises three TFT liquid crystal displays (LCDs) with two different display modes. The instruments are housed in a structure milled from a solid aluminum block, protected by a carbon fiber casing. The G-Force-Meter is completely new and it is one of the talking points of the Reventón. It displays the dynamic drive forces, longitudinal acceleration during acceleration and braking, as well as transversal acceleration around bends. These forces are represented by the movement of an indicator on a graduated 3D grid depending on the direction and intensity of the acceleration. Formula One teams also use a similar device to analyze dynamic forces. By simply pressing a button, the driver can switch to the second, quasi-analogical display, where there are the usual circular instruments; speedometer and tachometer. The G-Force-Meter still remains at the center of this display mode. Lamborghini has also picked up some of parent company Audi’s design language. For the first time, Lamborghini incorporated daylight running lights with the headlamps of the Reventón. Seven Light Emitting Diodes (LEDs) at each headlamp flank the Bi-Xenon main beam and they stay lit whenever the car is in movement. Due to the high temperatures in the rear lower part of the car, special heatproof LEDs are used for the indicator and hazard lights, stoplights and rear lights with a triple arrow optical effect. The Reventón is named after a fighting bull according to Lamborghini tradition. The car’s namesake, owned by the Don Rodríguez family, is best known for killing famed bullfighter Félix Guzmán in 1943. 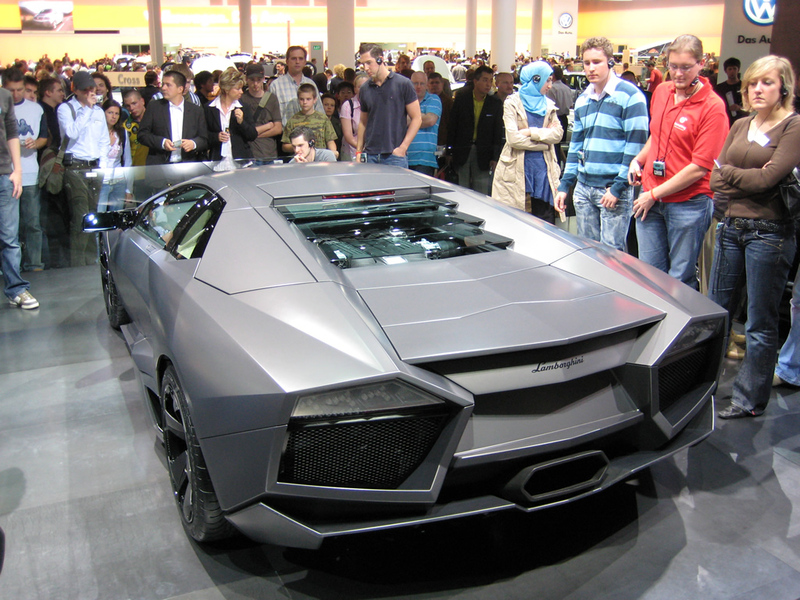 Reventón means “explosion” or “burst” in Spanish, when used as a noun. ; in automotive terms, it means “blowout, flat tire” when used as a noun (Harper-Collins Spanish Dictionary, 3rd ed., p. 640). When it was used as the name of a bull, however, it was intended to be interpreted as an adjective a quality or property of that bull in particular. Then Reventón means “he who is used to making things burst”.